This book presents all of the SQL skills your students will need on the job, using MySQL, today’s most popular DBMS for web-based applications. So it’s ideal for a SQL or MySQL course. But beyond that, its professional slant will add real-world perspective when it’s used in a traditional database course. This section starts by presenting the concepts and terms for working with any database. Then, your students will learn (1) how to use MySQL Workbench to work with SQL statements and (2) how to code the basic SQL statements for retrieving, adding, updating, and deleting database data. When your students complete this section, you’ll be able to continue with any of the other sections in the book. This section presents advanced SQL skills for retrieving data from a database. That includes working with summary queries, subqueries, data types, and functions. You can teach these chapters in whatever sequence you prefer, and you may want to defer some of them until later in the course. This section first shows how to design and normalize a database structure. With that background, it shows how to use MySQL Workbench to create an EER (enhanced entity-relationship) model for a database. Then, it shows how to implement that design by using the DDL (Data Definition Language) statements that are a part of SQL. Finally, it shows how to use views with a database to simplify data access and improve data security. When your students are done, they’ll be able to design and implement databases and views. And they’ll have a new perspective that will make them better SQL programmers. This section shows how powerful MySQL can be for creating reusable routines as stored programs. First, it covers MySQL's procedural language and shows how to manage transactions and locking from within a stored program. Then, it shows how to create and use 4 types of stored programs: stored procedures, functions, triggers, and events. In this section, your students can learn a starting set of skills for becoming a database administrator (DBA). These skills include how to secure a database, how to back up a database, and how to restore a database. Like all our books, this one has all of the Murach features that help your students learn faster and better. But here are a couple of features that are unique to this book. Unlike most SQL books, this one starts by showing how to query an existing database rather than showing how to create a new database. Why? For one thing, it’s motivating to see results right away, and querying provides that for your students; database design requires more study and background before you see results. But querying also helps to provide that background, giving your students insight into the kinds of decisions that have to be made in the design phase and the effects they have down the road. As a result, doing querying first makes it easier for students to learn how to design and implement a database in section 3. And it also prepares them for using database features like stored procedures in section 4. Unlike most MySQL books, this one shows how to use MySQL Workbench to enter and run SQL statements. MySQL Workbench is a graphical tool that’s an intuitive and user-friendly replacement for MySQL Command Line Client, a command-line program that has been around since the beginning of MySQL. In our experience, using MySQL Workbench instead of the command line helps students learn more quickly. Like all our books, this one includes hundreds of examples. In this case, though, the examples are SQL statements that range from the simple to the complex. That way, your students can quickly get the idea of how a SQL feature works from the simple examples, but they’ll also see examples that illustrate real-world complexity...a feature that’s often missing in other MySQL books. The main change is that the book has been updated for MySQL 8.0 and beyond, and new features have been added as a result. The most significant are window functions, covered in chapters 6 and 9; Common Table Expressions (CTEs), in chapter 7; and using roles for database security, in chapter 18. As always, we’ve improved both the text and the code examples as needed throughout, to make the book work better than ever for you and your students. This book and its instructional materials work great for any SQL course. This book is also an excellent supplementary text for a more traditional database course. Since MySQL is backwards compatible, all of the SQL statements presented in this book should also work with future versions of MySQL. In addition, most of the statements work with versions of MySQL earlier than MySQL 8.0, and we have done our best to identify any that don’t. 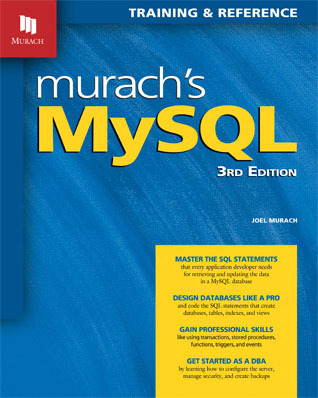 If your students use MySQL Workbench 8.0, all of the features presented in this book should work exactly as described. However, MySQL Workbench is being actively developed, so its functionality is improving all the time. As a result, you may want to use a later release. If you do, some features may not work exactly as described, but they’ll be similar enough that your students shouldn’t have any trouble with them. "This book was the text in my Database Concepts class, and I am so thankful that it was! It provided excellent explanations and examples of database syntax, queries, subqueries, design, etc. It spent sufficient time breaking down difficult topics into the basic elements and then built off of those concepts to bring everything together. The book was reasonably priced too! I aced the class and decided to take more database classes because of this book." "This is a fantastic book! It has more info than books at twice the cost, but it presents that info in a concise, digestible manner. I wish I had a resource like this when I was first starting with MySQL." "A very solid book with plenty of breadth and lots of examples." "One thing I enjoyed is that the book is well-indexed, and the material itself is concise, with stand-alone, real-world examples. It’s not theoretical, it’s practical, and presents topics in a friendly style that can be consumed painlessly." If you aren’t already familiar with the supporting courseware that we provide for a book, please go to About our Courseware. As you will see, our courseware consists of the end-of-chapter activities in the book, the files in the student download at our retail site, and the instructor’s materials. These components provide everything that you get from other publishers, in a way that delivers better results. If you are familiar with our courseware overall, here’s a quick summary of the courseware for this book. For a detailed description in PDF format, please read the Instructor's Summary. Appendix A (for Windows) and appendix B (for macOS) in the book give your students complete instructions for downloading and installing these items on their own systems.